EXPO CRISTÃ – has established itself as the official platform for launching products and services for Christian audiences in both Brazil and Latin America. The Expo attracts thousands of visitors annually from Brazil and abroad. During the four days of the Fair, major releases transform the event into a great business environment for industry, commerce and services. EXPO CRISTÃ – stands out as the great annual meeting that brings together sectoral entities, industry leaders, retailers, importers, class representatives, ecclesiastical and governmental authorities and other public figures all of which are fundamental to the demands, achievements and a benefit to all in the Christian consumer market. Recognized for its lead generation and the quality of the products showcased, EXPO CRISTÃ™ places Brazil as an influential trading partner among the big players in the global market, generating direct and indirect jobs. Through multisectoral networking EXPO CRISTÃ™ offers visitors unique experiences of interaction with leading industry brands, leaders, and technological innovations & updates . The Expo also filled with a superb variety of content for adults, youth and children. Including: congresses, lectures, workshops, shows and entertainment. 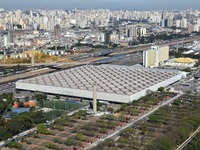 The Anhembi Convention Center is one of the most traditional venues in São Paulo and hosts large trade shows and events to this date. The venue is located in the Northern neighborhood of Santana, next to the Tietê Bus Terminal, Marginal Tietê and is one of the venues that is the closest to the Guarulhos International Airport. Despite the fair amount of hotels around the Anhembi area, you will find it necessary get a car to reach most of the hotels. If you prefer to stay in an area with more options of shops and restaurants, we recommend you to pick a hotel next to Avenida Paulista, in the Jardins area, which is approximately 20 minutes by car from Anhembi.